Hello there present friends, future friends, and probably not my brother. Brother, if you’re reading this, send me a sign, that isn’t a comment posted down below. Welcome to the first part of the sixth edition of The Worst Of The Best. Here’s a link to last week’s part, that actually covered two weeks instead of the customary one. If you’d like to read about skincare products made from goat milk, go here. If you’d like to read about hatmaker Polly Singer, go here. If you’d like to read about Magic Valley High’s production of “The Yellow Boat,” go here. If you’d like to read about really wild baseball pitches, and if you’d like to see them, please proceed. We’re covering May 10 – May 16, with a top-five list of the pitches furthest from the center of the strike zone. It’s all based on PITCHf/x, and there are going to be .gifs, in case you weren’t already aware. And a whole lot of screenshots, too many screenshots. Some pitches just narrowly missing: Cody Allen to Torii Hunter on May 11, and J.P. Howell to Adam LaRoche on May 15. 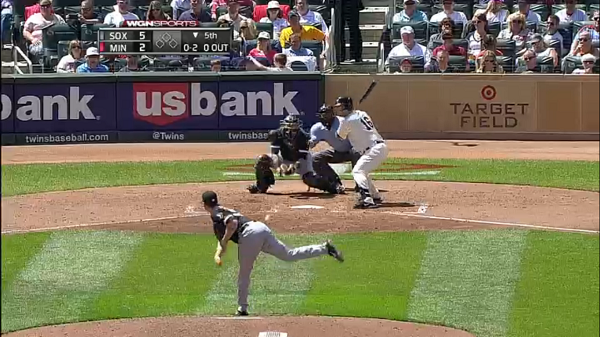 Cory Gearrin threw a pitch to Didi Gregorius that was more than four feet outside. Could Cory Gearrin throw a pitch so wild that Didi Gregorius couldn’t field it? Yes, of course, one doesn’t field pitches. We’re ready for the list now, and this week’s list comes with a special bonus. I’ll put it first! This is a bonus because it was kind of not a real pitch. It was intended to be a real pitch, but plans went awry unusually early in the process, like being late for something because you never left the house. PITCHf/x, of course, has no record of this pitch, in terms of its velocity or movement or location. PITCHf/x requires that a pitch be thrown in the general vicinity of home plate. 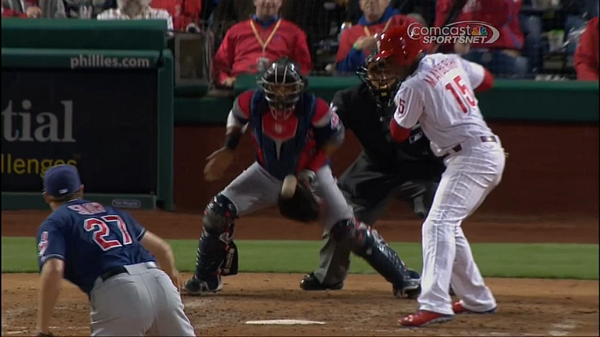 The Red Sox’s announcers very briefly wondered whether this pitch would even count as a ball. It had to count as something, so a ball it was, but this pitch was so bad professional baseball announcers weren’t sure if it would count as a pitch. I know I’ve seen worse, but I can never remember the name of the guy who did something crazy in the Marlins’ old stadium. I think he pitched for the Nationals. You’d think I’d remember the details of something like this, but, here we are. I have not a vivid memory of the names. I have only a vivid memory of the pitch, and the .gif that I made of it sailing over the dugout. Watching this gives you an idea. So Doubront accidentally threw a pitch a third of the way up the first base line. It’s conceivable, then, that Doubront could throw a pitch 100% of the way up the first base line, to the first baseman. And he could make it look like an accident, like it was supposed to be a real pitch. And then it could function as the world’s most deceptive pick-off attempt, with a runner on. Doubront could practice it over and over and over away from the cameras so that no one would have any idea what he was up to. He could get it perfected, then he could take it into a game, and pick off a runner in a critical spot. Then he could get called for a balk, because it would be a balk. Someone should’ve told him earlier. Every so often, the ball slips. It’s not always this dramatic, but it happens, and the resulting pitches go all over the place. Sometimes it’s the fault of the ball, sometimes it’s the fault of the pitcher, and sometimes it’s the fault of the mound. Some pitches are more important than others, in terms of leverage. Imagine you’re a closer. You’re protecting a one-run lead, but the bases are loaded with two outs and you’ve got a full count. In this situation you need to throw a strike, or at least a convincing ball, or else the game will at least be tied. You know the ball might just slip out of your hand. No matter what you do, sometimes it just happens. How would that not just haunt you? How would that not just paralyze you into inactivity? I’d be terrified. I don’t think I have the fortitude to be a closer. Or the arm. Generally, a cutter and a slider are very similar. You can usually think of a cutter as being a halfway compromise between a slider and a fastball. The arm action is similar, and the grip is similar, and the results are different, but not too different. Now, that’s speaking generally, and I don’t know much about Bryan Shaw. I can see that his slider and his cutter are pretty different pitches. He leans heavily on his cutter, and his slider is significantly slower. But the arm actions probably have a lot in common. In this at bat, Shaw threw Mayberry five pitches. Four were well-located cutters in the upper half of the strike zone. One was this slider. If Bryan Shaw could go back in time and tell himself something right before this pitch, he’d probably say, “hello, it’s you, Bryan Shaw, I am traveling through time, this is amazing.” And then the non-time-traveling Bryan Shaw would be really confused and distracted and it might…look a lot like this, actually. Hold on a minute. Now for the latest edition of Find The Baseball. If you find the baseball, you could win an all-expenses-paid trip to the sidewalk in front of wherever you are. Go outside, it’s good for you. Go outside, even if you can’t find the baseball. 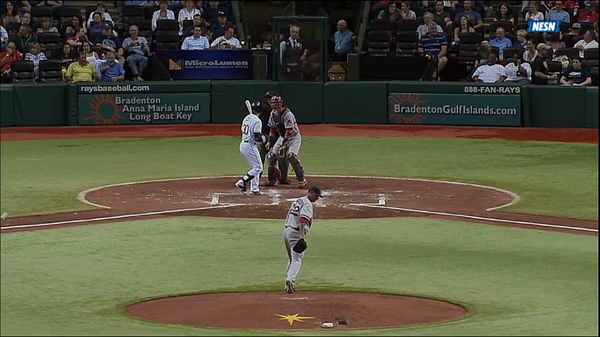 Every time, every single time, I am just tickled by pitches that end up in the strike zone after they bounce. I actually think these should count as strikes. They’d be tricky to call accurately, so umpires would need a lot of training, but consider the strategy involved. There would be a new way to try to pitch around a dangerous hitter: throw balls deliberately in the dirt and bounce them. It would always be there as a possibility, with the downside being a ball or a wild pitch. Hitters, presumably, would never do much more than single, in the event of a swing. Think about it, Selig. Think about it before you move on to expanded replay. There are priorities. One of these people is looking in the direction of the baseball. He is the one not playing. Consider this evidence that catchers close their eyes when they’re catching. Animated .gifs have revealed this to typically be true so maybe we don’t need this evidence. Whatever, never hurts to have more evidence. Bad for the people who have to file all the evidence, though. 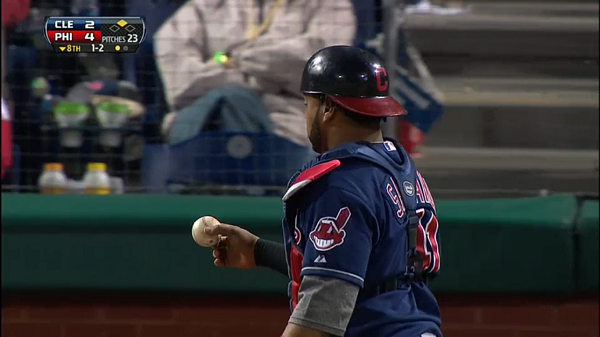 Eventually Carlos Santana found the baseball, and held it as if he considered it magic. “For several consecutive instants, this baseball completely disappeared.” It’s customary to discard a baseball that’s been thrown in the dirt, but Santana appears reluctant, because who wouldn’t be reluctant to discard something potentially magical? Yu Darvish later came by and obtained the baseball and stuck it in his back pocket. Somebody needs to check that guy out. Look at the motion in this .gif. The pitcher throws a bad pitch and just kind of walks around. The batter turns around and doesn’t leave the box. The umpire basically stands still. The catcher drops to his knees, then gets up and sprints to his left, then bends over to recover a moving baseball. If this .gif were a high school group science project, the umpire, the batter, and the pitcher would be the dumb jocks, and the catcher would be the determined nerd who wants a high grade and who agrees to do basically everything. 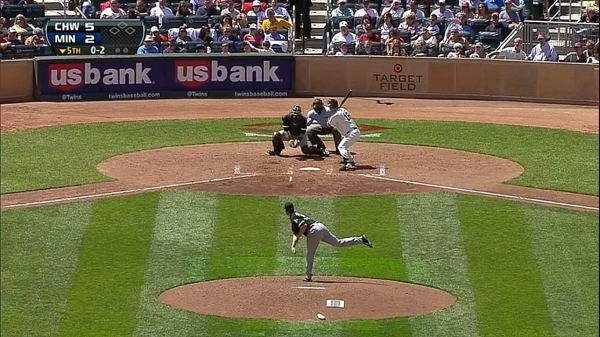 If I were Russell Martin, I’d probably find it easy to be resentful, but then again this is a pretty good first pitch to throw to Yuniesky Betancourt. He’s still not good, everybody! He’s very not good! The blur makes the baseball look like some kind of oval-shaped pill. But that wouldn’t make any sense, if the ball were a pill. So this is just a dumb observation that doesn’t add anything to anything. 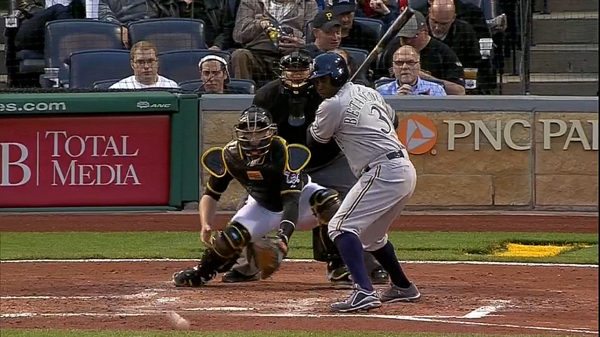 If you look at the .gif, you’ll notice the baseball strikes Martin square on a patch on his chest. That’s a Rawlings patch, signifying that Martin once won a Gold Glove, for his defensive catching. Martin did a good job of blocking this knuckle curve and so the symbolism is strong in this sequence. “That pitch hit Russell Martin right in the Gold Glove,” you could say, wrongly. Are you blind? 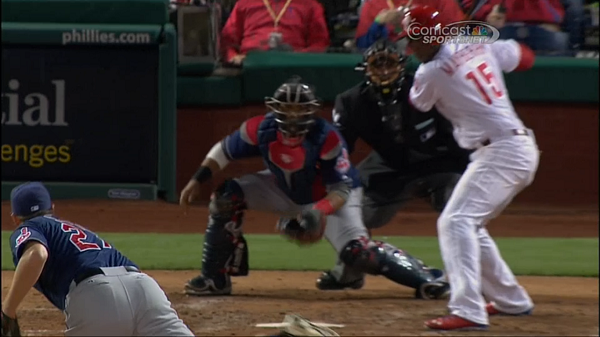 This was an 0-and-2 breaking ball, so it was probably supposed to be off the plate. You don’t want to throw a strike in that situation, not to Josh Willingham; you just want to throw a ball that looks like it might be a strike, so Willingham thinks about chasing. 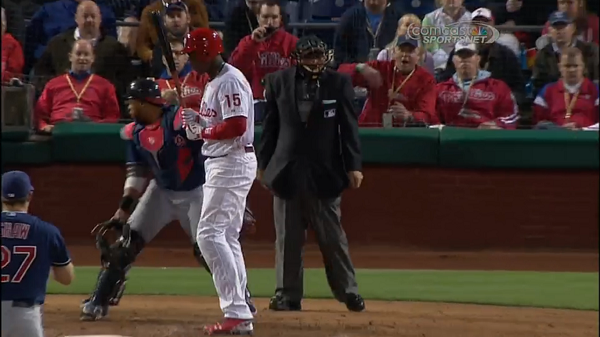 This was not that ball, and if you look at Axelrod’s body language, you can see that he was disappointed in himself. He wished that he would’ve thrown a better pitch, since this was basically a waste. 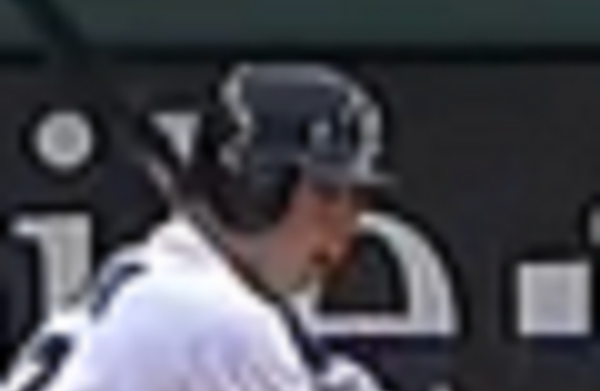 But if you think Axelrod was disappointed in himself here, fast forward two pitches, when Axelrod hit Willingham to put him on base after there was an 0-and-2 count. It can always get worse, Dylan Axelrod. You wouldn’t believe how much worse it can get. I’m not sure what this was supposed to show. I took the screenshots and either I forgot what I was going to say about them, or I assumed I’d figure something out later. 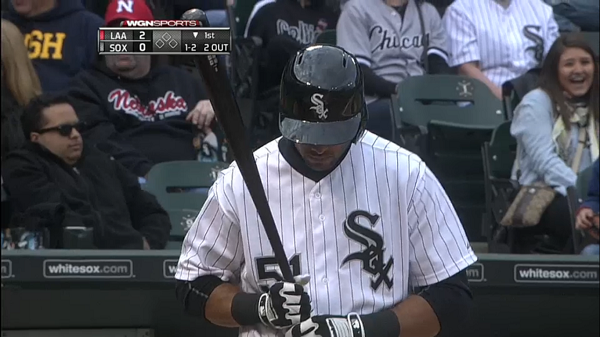 The Twins and White Sox broadcasts used different camera angles for this game. All right. 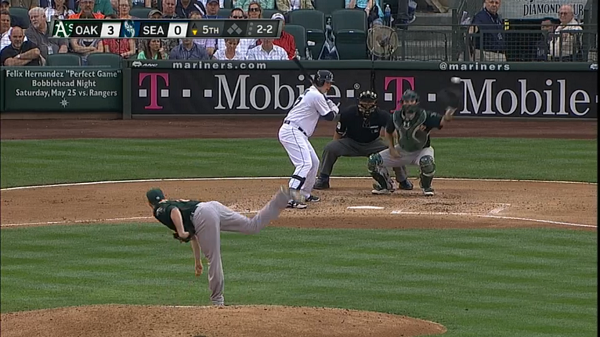 Look at that pitch, twice. This isn’t why you shouldn’t throw many sliders to opposite-handed hitters. You shouldn’t do that, usually, but not for this reason. This isn’t a reason for anything. This is just awful, from a guy with a nigh-unhittable changeup. Parker looks down at the ground as the pitch arrives. He hasn’t lost his footing, so it seems like he just doesn’t want to see what he just did. But he watches the pitch all the way into the glove, so what he did’s already been seen. There’s no pretending this didn’t happen, Jarrod Parker. It’s being included in a FanGraphs post. The word is out. My favorite part might be the casual way in which the pitch is received. A lot of times, with wild pitches like this, the catcher will frantically dart over and up to make a catch out of desperation. Derek Norris is very smooth and matter-of-fact about everything, as if he knew this could be the outcome of the slider call. Which means maybe Norris shouldn’t have called for a slider, but what do I know, I’m just a guy with a spreadsheet and .gifs and a computer and a half-empty box of pens and headphones and a small foam airplane and screen cleaner fluid and a notepad and an empty water glass and that’s probably all you need to know about my desk. Look closely at that image. Look also at the .gif above, again. Look at Smoak’s face. Enhance! Smoak: That pitch was way wild! Norris: You are slugging .317. I know I’m supposed to be critical of the pitchers, here. It’s the pitchers who throw the bad pitches that end up in these articles. 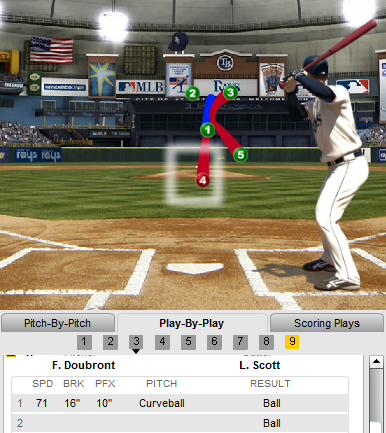 And, to be sure, this was a bad pitch, even in an 0-and-2 count. But this was also a bad job by Chris Iannetta, even though he did manage to block the baseball from getting behind him. There are two strikes, meaning with a swing and a wild pitch, Rios can try to run to first base. 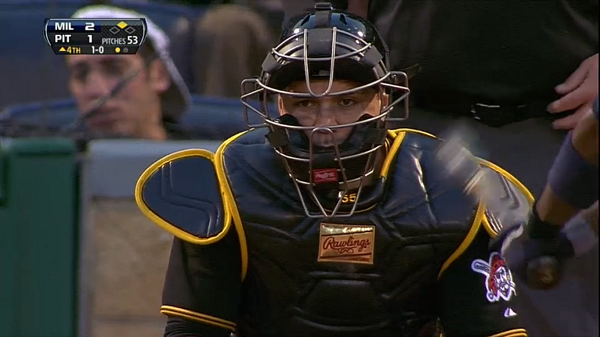 Meaning Iannetta has to be prepared to keep the baseball in front of him. What he does is turn to his side and try for a stabbing backhand. That’s not skill that blocked the baseball — that’s luck, and bad technique. I don’t know much about catching, but I do have a sense this isn’t the way it’s supposed to be done. Look at the catcher in the Axelrod pitch .gif. I came in looking to criticize an Angels pitcher and I’ve come away criticizing an Angels catcher. These days it is really easy to criticize the Angels. I can’t tell if that’s Albert Pujols sitting behind home plate in the red jacket and hat, but I also can’t tell if it’s not Albert Pujols. Doesn’t really seem like much of a team player, potentially. Is that girl back there laughing about how bad a pitch Jerome Williams just threw to Alex Rios? That would make sense. But, no. She’s laughing about something the person next to her just said a moment ago. He’s been cropped out of the image. We hoped you liked reading The Worst of the Best: The Week’s Wildest Pitches by Jeff Sullivan! 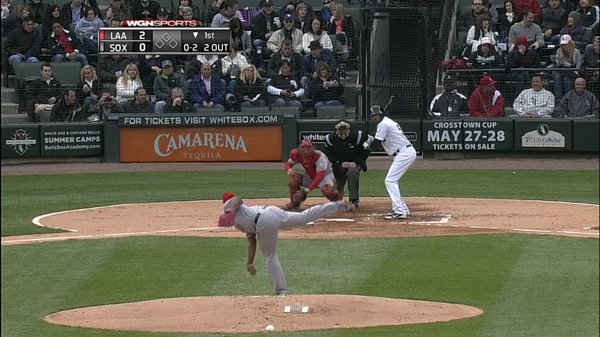 With runners on base, Doubront’s “pitch” might have been a balk. I don’t know.